Golconda Fort, one of the most magnificent fortress complexes in India, is located at Ibrahim Bagh, Hyderabad, Telangana. The history of the Golkonda Fort dates back to the early 13th century, when this south eastern part of the country was ruled by the Kakatiyas. It is built on a granite hill 120 metres high, surrounded by massive crenellated ramparts. The bulk of the ruins of this fort, date from the time of the Qutub Shahi kings, who had ruled this part of the land in the 16th and 17th century. 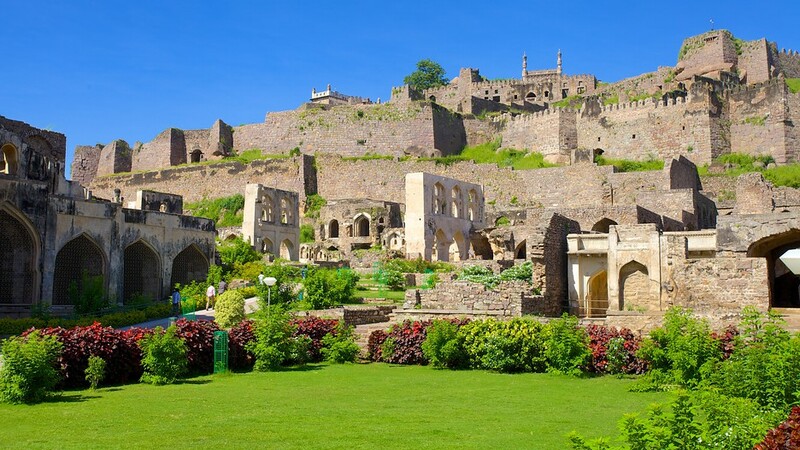 Golkonda consists of four distinct forts with a 10km long outer wall having 87 semi-circular bastions; some still mounted with cannons, eight gateways, four drawbridges and number of royal apartments & halls, temples, mosques, magazines, stables etc, inside. The lowest of these is the outermost enclosure into which we enter by the ‘Fateh Darwaza’ (Victory gate, so called after Aurangzeb’s triumphant army marched in through this gate) studded with giant iron spikes ( to prevent elephants from battering them down) near the south-eastern corner. At Fateh Darwaza can be experienced the fantastic acoustical effects, characteristic of the engineering marvels at Golkonda. A hand clap at a certain point below the dome at the entrance reverberates and can be heard clearly at the ‘Bala Hisar’ pavilion, the highest point almost a kilometre away. This acted as the warning note to residents in case of danger though now it is a mere amusing diversion to visitors. There is also supposed to be secret underground tunnel leading from the ‘Durbar Hall’ to one of the palaces at the foot of the hill. The tombs of the Qutub Shahi kings, built with Islamic architecture lie about 1 km north of the outer wall of Golkonda. These graceful structures are surrounded by landscaped gardens and beautifully carved stonework. The fortress city within the walls was famous for its diamond trade and many famed diamonds including the Koh-i-noor, Hope, Regent and Beu Sancy diamonds have come from here. Please visit our official Travel Guide for more information on famous tourist spots in Hyderabad. Ousteri is a large water-body in Ossudu village, north of Kaveri River, around 10 kms from Pondicherry town. The tank was constructed during the Vijayanagara dynasty around 500 years ago. It is connected through the Suthukanni channel to Gingee and Varaha Rivers. Ousteri Lake has been recognized as one of the important wetlands of Asia by the International Union for Conservation of Nature and Natural Resources (IUCN). In 1995, the lake recorded some 20,000 birds and in 1998 it went up to 25,000 birds of 44 species. If you love watching rare and colourful birds in their natural habitat, this is a place not to be missed. Gandhi Statue is a four-meter statue of Mahatma Gandhi surrounded by eight carved monolithic pillars. 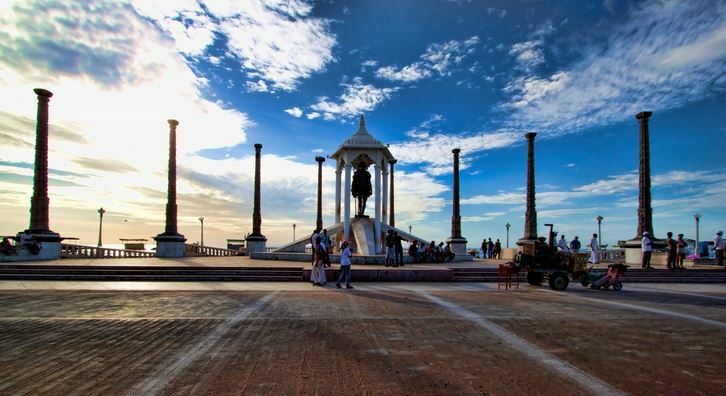 The statue, standing on the beach front of Pondicherry was built by the famous sculptor Roy Choudhary from Madras School of Art and Crafts. Statue of Dupleix, which is 2.88 meter tall, stands at the southern end of the park. Almost every city with a beach in India has a Gandhi statue, but this is the biggest of all. You can visit in the evening to enjoy the cool breeze and the yummy street foods of India like Chaat, Sev Poori, Masala Corns, Bhajia, Gol Guppa, Pani Puri or Puchka, which is a favorite of all women in India. Auroville is an experimental township located 8 km north-west of Pondicherry in East Coast Road. Founded in 1968 by Mirra Richard, Auroville was designed by the French architect Roger Anger. It is meant to be a universal town where men and women of all countries are able to live in peace and progressive harmony, above all creeds, all politics and all nationalities. The inauguration ceremony of Auroville was held on 28 February 1968 when soil from 124 countries was placed in a lotus-shaped urn and mixed to symbolize universal oneness. The Matrimandir in the middle of the town has been acclaimed as an outstanding and original architectural achievement. 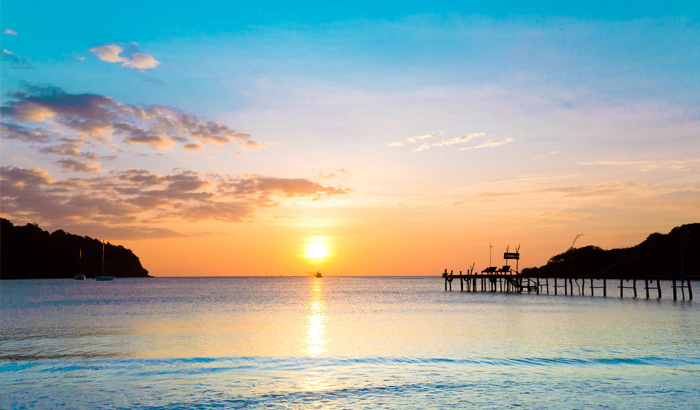 Please visit our official Travel Guide for more information on famous tourist spots in Pondicherry.